Our two bedroom suite offers guests an immense pleasure of luxury. Consisting of two bedrooms, two bathrooms, a spacious living room with a balcony and incredible sea views, this suite is most elegant and ensures guests feel pampered from the minute they arrive until they leave the hotel doors planning their return, naturally. 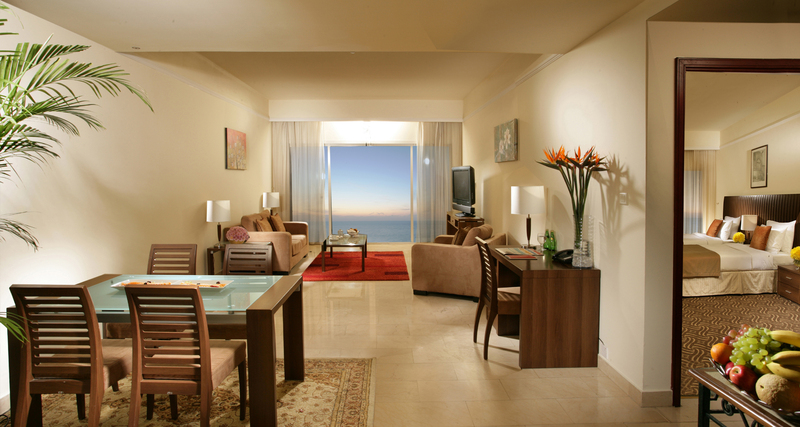 With 89sqm, this suite offers guests a true sense of home for a longer stay with us or for a stylish family living. Choose from a king-size bed or twin beds in the bedroom area and relax in comfort inside or out in the cozy living room or on the balcony where the warm sun brightens every day of your break at our hotel. Whether you're with us for business or pleasure, your stay will be enhanced by our surroundings combining modem stylish design with our fabulous traditional cultural heritage. Tissue rolls and bath linen.